At this year’s TechEd in Las Vegas, SAP introduced the highly anticipated SAP HANA Express Edition. 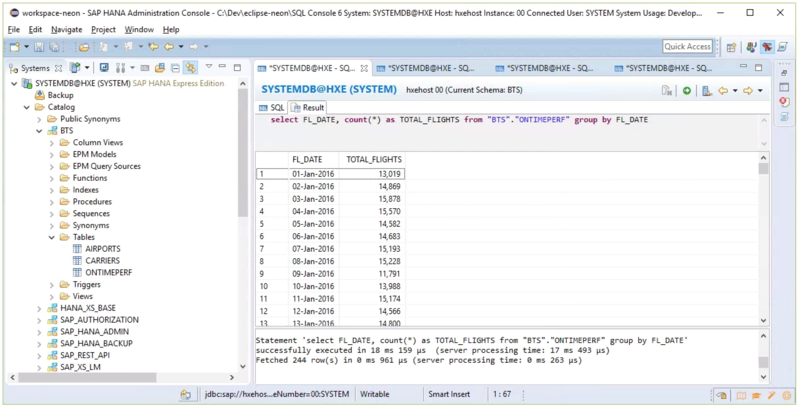 For the very first time, developers can now run SAP HANA on their own laptops using as little (*) as 16 GB RAM. It is optimised to run on laptops, desktops and mini-PC’s, and is free to use up until a memory consumption of 32 GB. You can install it as a native binary on Linux, or as a pre-configured, ready-to-use VM image. (*) 16 GB RAM is still not standard on every laptop, but RAM is getting cheaper, 32 GB laptops are becoming more widespread, and really, 16 GB to run SAP HANA on is truly an achievement! I have successfully run the VM on a 2012 MacBook Pro with 16 GB. And much to my surprise, if you tweak both the laptop’s as well as the VM’s resources well, it runs pretty smoothly! Would I only do SAP HANA development, this 16GB configuration would be pretty adequate. 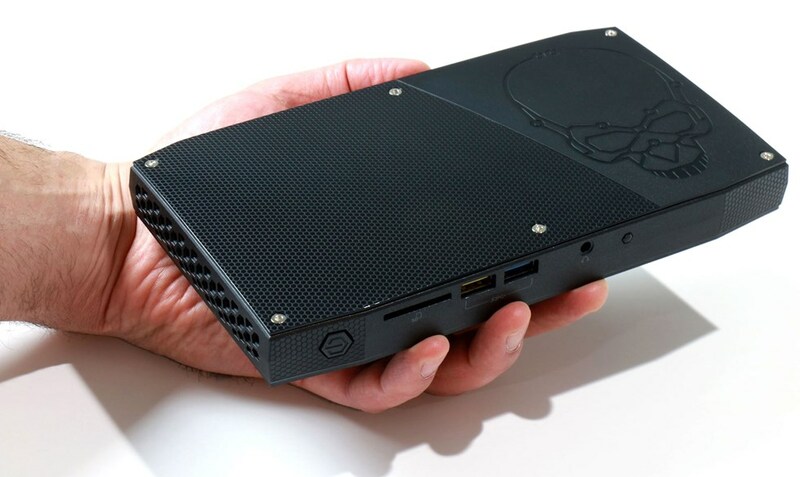 Enter the Intel NUC “Skull Canyon”. The device is literally as cool as it’s name implies. Mine has 32 GB RAM, a 250 GB SSD, and the latest Intel i7 processor. It has peripheral connectivity to whatever thingamajiggies you can imagine, and has a nice hack0rz-approved ‘skull’ embossed on its lid. It measures just 8.3″ x 4.6″ x 1.1″ (211mm x 116mm x 28mm). I decided to install Windows 10 on it, so I could run Eclipse with the HANA Tools on it, and benefit from the ease-of-use of simply loading the VM instead of going through the hassle of installing HANA Express Edition by hand. I assigned 16 GB to the VM and assigned 4 cores, fired up the VM and finalised the recommended steps for security settings and installing the developer license. To see whether it was all successful, I opened the HANA Cockpit, and was happy to see I had a working SAP HANA environment in the palms of my hand. After this short, blissful moment, I decided to see how it would handle lots of data and whether it could hold its own against the enterprisey HANA installations. First problem was, where to get loads of data. After some web scouring, I found the Bureau of Transportation Statistics website, part of the United States Department of Transportation. It has lots of data available in CSV format for aviation, marine, railway, highway, basically anything related to transport. 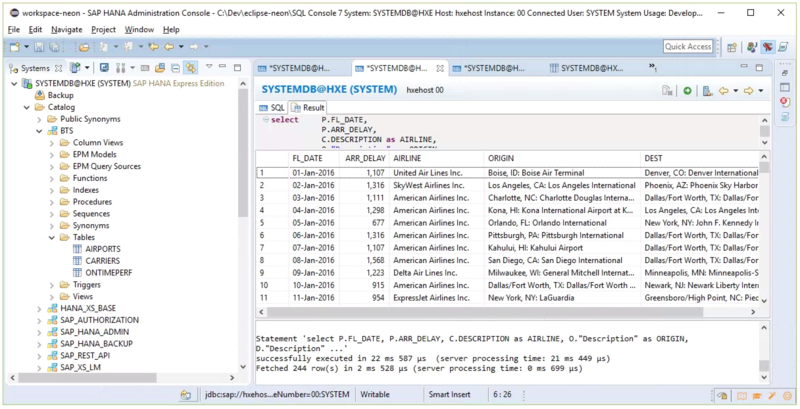 In the Aviation section, they held data from airline “On-Time Performance” of every domestic US flight since 1987. At least, it would give me the big dataset I wanted. I downloaded the performance data for the month of August (In October, the latest available data was for August) and it provided a zip with ~450K rows of data. Honestly, I wouldn’t have expected that many air movements in one month, but for my test this wasn’t enough data. I downloaded all 8 months of 2016 worth of data, and ended up with a dataset of almost 3.8 million records. Matching the airlines with the performance data revealed this year only 310 distinct airlines performed domestic flights in the US, which seemed much more reasonable. Intrigued by the amount of airlines and number of daily flights, I wanted to stress my dataset a bit further. The half-a-millisecond response for retrieving the COUNT was nice, but not much real-use value. Holy cannelloni, on average between 11k-15k air movements per day! Although the query is still a walk in the park for any database, it took just 17 milliseconds to deduct that data from the 3.8 million records. Still impressive, but not enough. 3) The query took just 5 milliseconds more than the previous query to complete. You could also say, it took just one twentieth of the duration of the blink of an eye to finish. Please note, I am no DBA as you could tell from the above SQL, I haven’t used any indices, and I haven’t optimised the HANA instance significantly yet. I think it is safe to state the Intel NUC has true server capabilities and, running SAP HANA Express Edition in a VM with only 16 GB RAM assigned to it, has no visible degradation in performance. If you want to try it out for yourself, go to http://go.sap.com/developer/topics/sap-hana-express.html and start developing! This is great. I’m currently running HXE at the moment on a 24 GB VMware workstation instance at home in my i7 gaming rig running Win10 Host OS. Unfortunately my home PC maxes at 32GB of RAM so I’m toying with a separate project of running VMware ESXI hypervisor to eliminate the footprint of the host OS. I did toy with the idea of running ESXi from the NUC’s bare metal (see for instance http://www.virten.net/2016/06/vmware-homeserver-esxi-on-6th-gen-skull-canyon-intel-nuc/) but I deliberately installed Win10 (and thus was “forced” to use a type-2 hypervisor) since I wanted to install development tools on it as well. Mine has an Intel SSDSCKKW240H6 250GB drive. I’ve heard similar issues with Samsung M.2 drives as well. I got all excited when I saw a NUC on Amazon for $570 then realized it was base. The portability is awesome. Right now I have a linux tower with 32GB under my desk that will have to do until I can save some pennies. It seems to happen possibly during intense i/o (like swap thrashing) on any guest VM, not specific to HANA VM. I’m curious how your experience has been? I haven’t noticed any issues yet, but admittedly I don’t put it under severe load that often. Is it strictly related to VMware hypervisors or other brands as well? In my case, I’m running VSphere (ESXI) on the Skull Canyon NUC, so that’s really my only experience. It really only happens when I try to get away with running too many VMs at once for prolonged periods. Also, I am having really bad luck for the same symptom with trying to run HXE 2.0 in this environment. I keep corrupting the HXE 2.0 OS’s file system when I have to hard reboot it. I end up stuck at a GRUB boot menu error and everything is screwed. I’ll try HXE 2.0 on VMWare Workstation setup to see if I have better luck, though. 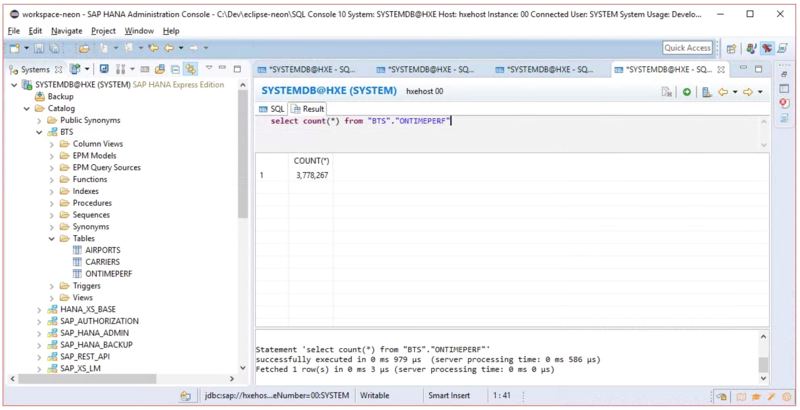 Looks like you’re using the same data set I used in [https://blogs.sap.com/?p=101918] and for my hands-on session DMM273 @ TechEd && d-code 2014. I also loaded these data into my HXE VM and can confirm that it’s quite a good match of data and technology for a sandbox. Cool! Wasn’t aware of your blog… Will dig up the 2014 TechEd USB stick to go through your session though! Yesterday I found this great dataset and think about a use case in hxe . Sweet! Also has it in ArcGIS map data format, so you could potentially plot in onto their maps. Interesting!